Christmas is a time for gathering the family together, sharing the love and remembering the spirit of humanity in all we do. It is also the time for extravagant lighting displays and the inflated energy bill that goes with them. 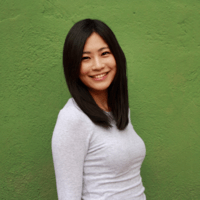 Whether you’re a renter or a homeowner, the joy associated with draping your home and front yard in Christmas lights can be substantial, so we wanted to find out if there was a way to increase the joy by saving you money. We compared purchase and electrical usage costs between incandescent and LED bulbs and also looked at the costs of installation, to find out how we could help deflate your Christmas lighting costs overall. We created the above graphic by calculating each state’s costs to run two types of Christmas lights; incandescent or LED. We assumed the average household used 10-15 strings for a total of 1,000 mini bulbs per household. Electrical usage was determined using data from Christmas Lights, Etc. here and here, with 1,000 incandescent bulbs using 408W and 1,000 LED bulbs using 69W. Then, we multiplied the total watts used by those 1,000 bulbs, by the kWhs needed to run your lights for five hours per day, for the 30 day season, using electrical rates from U.S. Energy Information Administration. 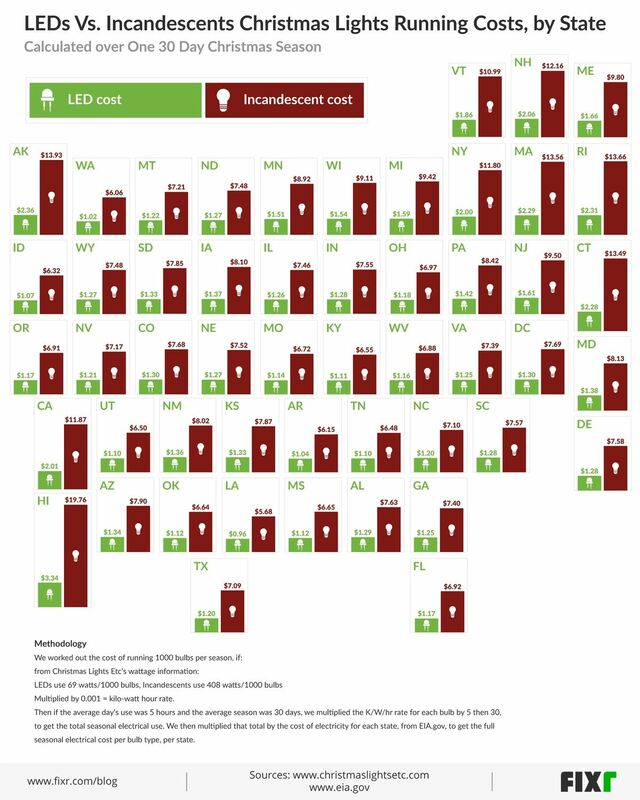 The graphic shows the resulting comparative cost to run incandescent or LED bulbs for each state. As you see, the state with the highest electrical costs per kWh is Hawaii, which leads to a seasonal cost of $3.34 for LEDs and a significantly higher $19.76 for incandescents. This is due to the fact that the power required for 1,000 mini incandescent bulbs is 408 watts, whereas mini LEDs only require 17% of that at 69 watts. Even in the state with the cheapest electrical charges, Louisiana, the ratios are the same, with incandescents costing $5.68 for the month and LEDs only $0.96 for the entire month. If homeowners opt for LEDs, more than 80% of the states would pay less than $2 for the entire month; which makes running your Christmas lights far more affordable. As seen above, should homeowners stick to incandescents, however, not even Louisiana would get away with spending less than $5. While these costs seem low for one season, if we consider that you’ll use your lights every season for 10 years, you’re looking at spending nearly $200 dollars on electricity alone. If you change to LEDs however, you’ll save $164,20, with a total electrical expenditure of only $33,40 as a result (In Hawaii). In Louisiana, your expenses will drop to less than $10 if you opt for LEDs, with all of the other states falling somewhere in-between. Keep in mind that this is the cost of running the lights only, and we’ll look at the relative cost of purchasing and installation below. The graphic shows the year-to-year running costs of Christmas lights, but the major expense is upfront. Two factors need to be considered: the first is the cost of the lights themselves and the second is the cost of installation (Assuming you go with a professional, which is recommended, especially for complex jobs). While LEDs win the energy consumption test, for now, they still lose the race when it comes to their initial purchase price. If LEDs cost, on average, $260 for 13 strands at $20 dollars per strand, and incandescents cost only $72 dollars for 9 strands at $8 per strand (based on average costs and strands required for the average home), then incandescents win hands down. You’ll also spend a bit more on hardware for LEDs as they come on shorter strands, which may require more connectors and anchors. However, if we take the lifespan of the bulbs into consideration, we get a different view again. Incandescents have an expected lifespan of 1,000 hours whereas LEDs will last 50,000 hours! If we plug that into our Christmas season equation, the results speak for themselves. If the lights burn 150 hours per season, LEDs will last over 333 years, while incandescents will have to be replaced after only 6 years. Even though LEDs cost more initially, you’ll have to replace your incandescents 50 times before you have to buy new LEDs, which makes the real cost comparison $3,600 for incandescents Vs. $260 for LEDs. The final piece to the costing puzzle is the installation. Of course, some homeowners choose to do this themselves, so this isn’t a factor. If you have a larger house or want to create a more complex lighting display, however, then calling in the professionals is a good idea. There is not only a range of options when it comes to light bulb styles and colors but also a variety of configurations, which makes it hard to do a direct comparison as above. We can estimate that for an average house, looking at light installation along the roofline, windows, doors, and some landscaping, you’re looking at a cost of between $1,500 to $2,500. This figure includes the cost of labor, installation hardware, removal, and storage. Also, there isn’t much cost difference between incandescents and LEDs other than the fact that LEDs are generally on shorter strands so require more connecting hardware as mentioned above. You’ll also need to make sure your lights run on a separate circuit so you don’t cause an outage for the rest of the house. It may be wise to bring in an electrician to assist, to make sure everything is safely connected. At the end of the day, it comes down to your intended lighting requirements. If you only have short-term plans for your lighting — maybe you’re renting and don’t want to invest til you move into your lifelong family home, or for some other reason you’re looking for a lighting solution for this season only — then incandescents are definitely the short-term, cost-effective option. However, if you’re ready to make a lighting statement and know that your lights will be for a lifetime of Christmases(or other celebrations), LEDs win hands down. They last over 50 times longer than incandescents, they cost almost the same to install, and your range of options can even exceed incandescents with new programmable technologies — and we haven’t even taken solar charging into account, which would mean even greater savings. We hope this has helped shed some light on the situation so that your festive season can be spent basking in the glow of your more cost-effective, freshly lit-up home.